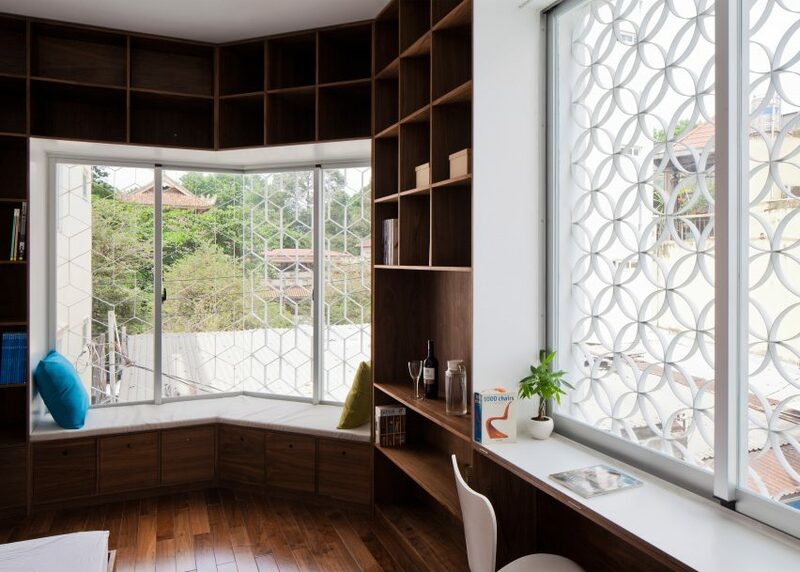 Patterned grills screen the windows of this terrazzo-covered house in Ho Chi Minh City, which has been designed by local studio Sanuki Daisuke Architects to make the most of the site's little natural light (+ slideshow). 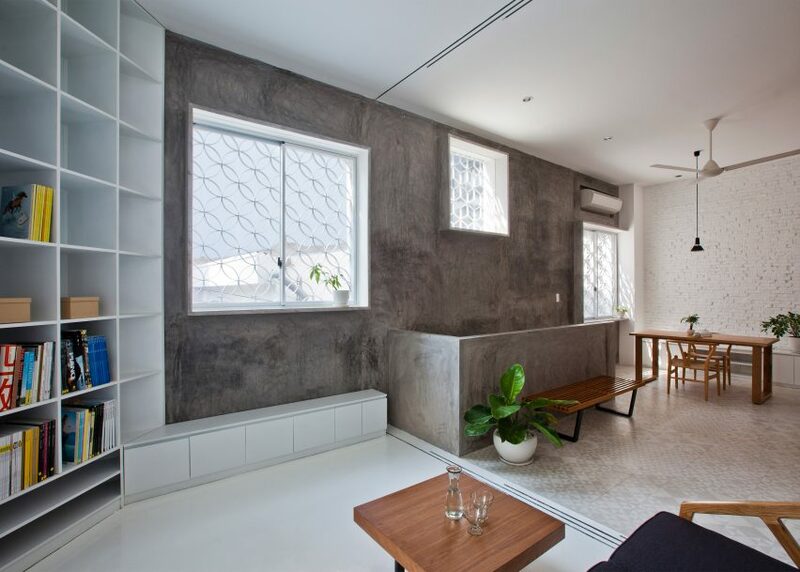 The four-storey residence sits on the corner of two narrow city-centre alleys, locally known as hems. These hems – at times measuring less than one metre wide – form a capillary-like infrastructure to link houses in the Vietnamese city. 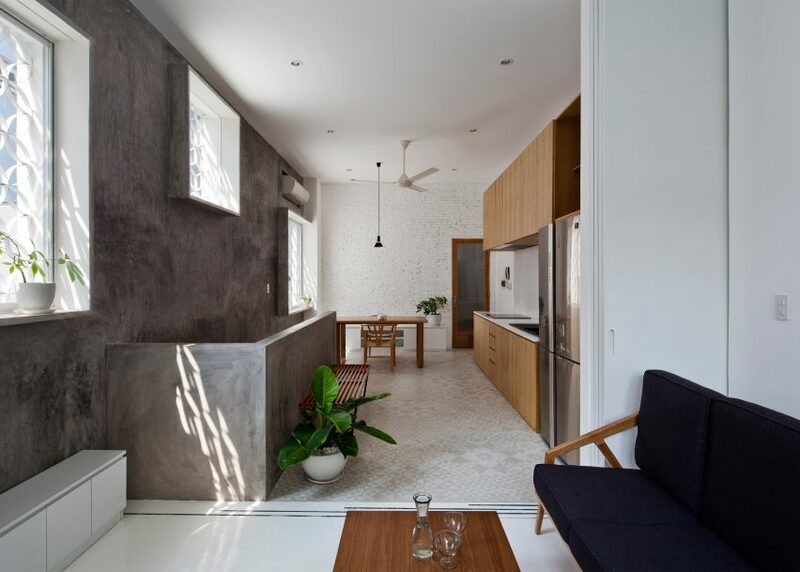 Sanuki Daisuke Architects, who worked on the project in partnership with local architect Huynh Anh Tuan, called the project Hem House in reference to these backstreets. The building is shaped to take full advantage of the plot. It has one chamfered corner, which is wrapped by a large window. "When walking around these alleys, we can see very vivacious Vietnamese life," said the architects. "Houses in the hem are usually covered by fences or smoke glass for security, privacy and shading. As a result, the houses look like cages," they added. "The spaces inside the house in those cases are dark and broody." 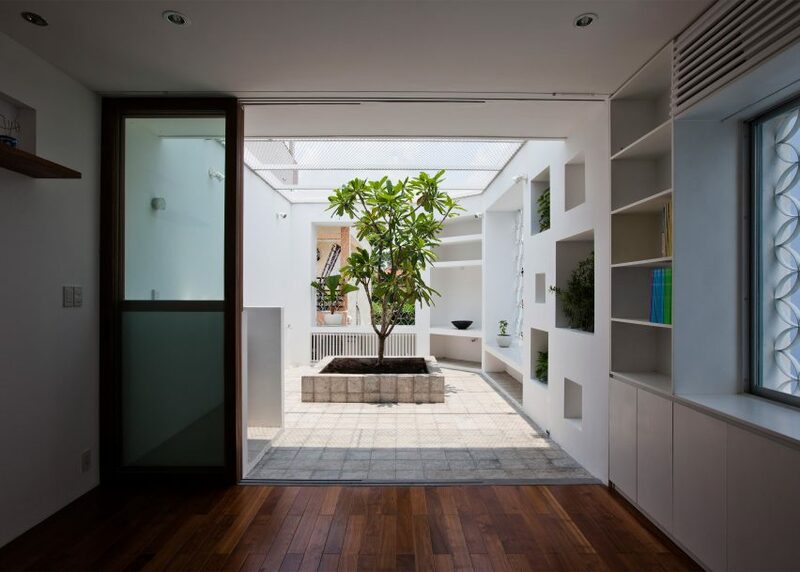 The narrow alleys mean houses typically suffer from a lack of privacy and natural light, with residents forced to use electric lights to illuminate the ground floors of their houses even during the day. To combat this, the architects introduced large windows and a secluded rooftop garden, and aligned the front door with the opposite alley. 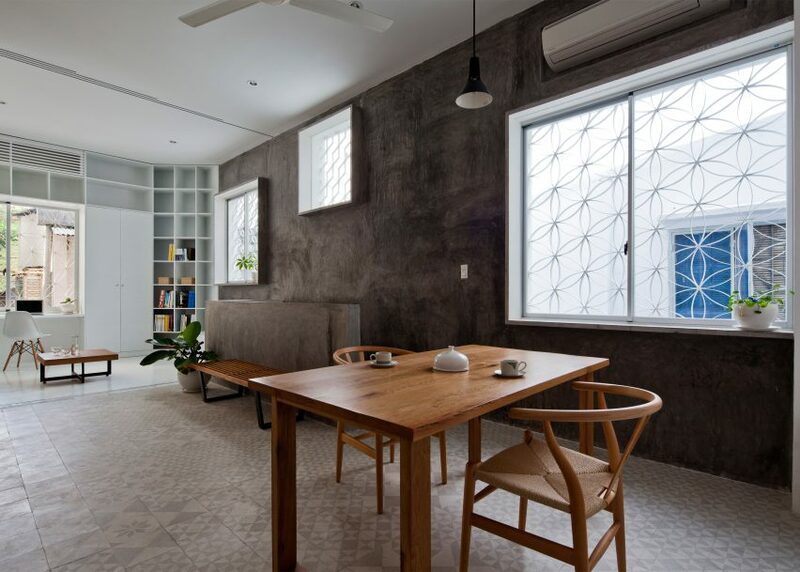 The windows are irregularly placed – indicating the different ceiling heights within – and covered in patterned steel mesh that allows the breeze to circulate, while also providing security. 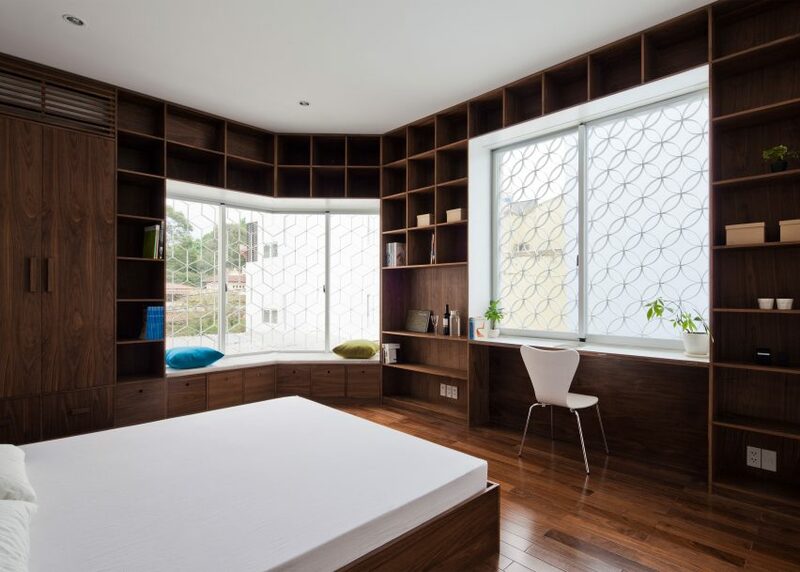 The flower-like and geometric patterns partially obscures views of the interior. Both are based on motifs found in Vietnamese textiles. "The locations of the openings were carefully decided by surrounding condition and future planning of neighbourhood," said the architects. "We design the views of hems from openings to become a part of interior space in this house." 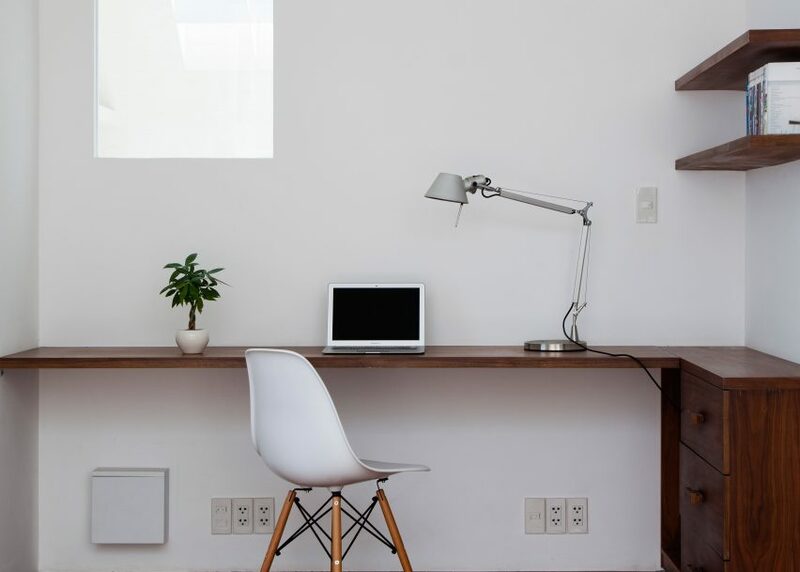 "Housing in the hem is usually considered negatively. However we carefully observed and transform the condition of it," they added. "This could be the alternative house to enjoy the life in the hem." 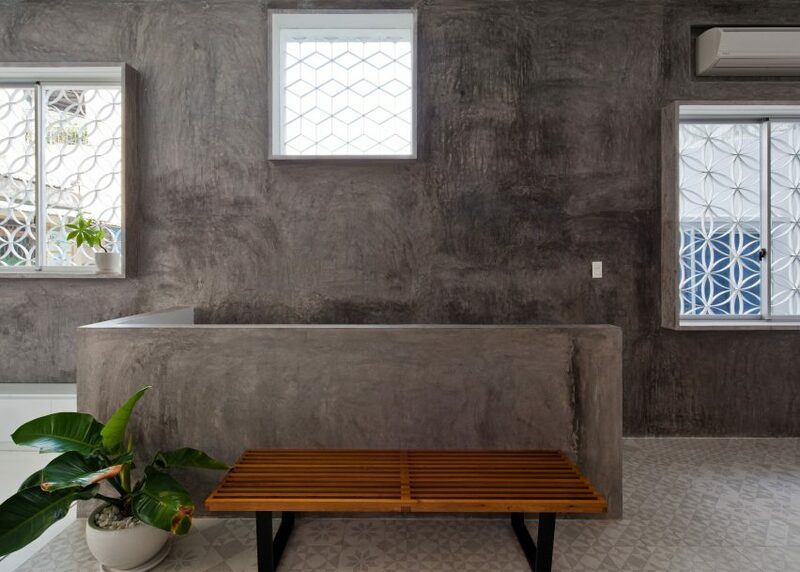 While the outer walls are finished with coarse-textured terrazzo, inside spaces are finished with smooth cement tiles and plasterwork. 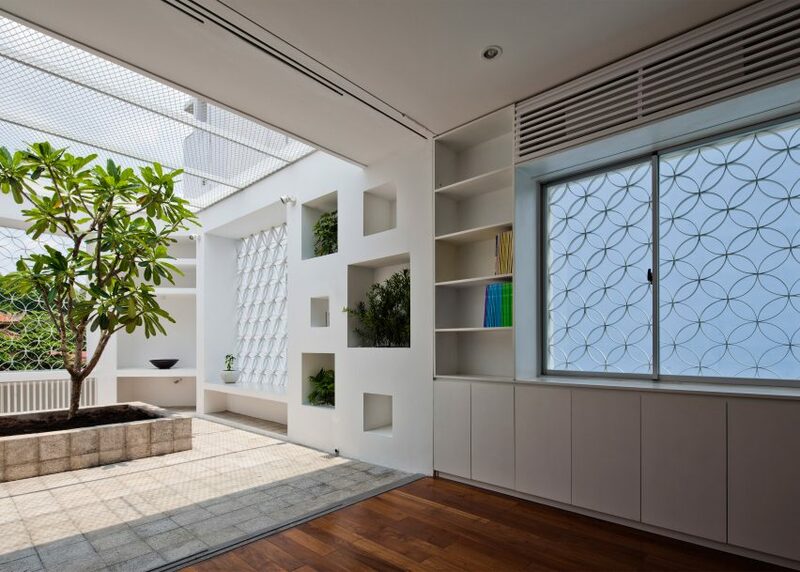 Deep window protrude from the internal walls and are used as a window seat, a table and as display ledges for pot plants. Further recessed shelves arranged around the window frames are used to store books inside, while on the terrace, niches are filled with planting. Similar shelves line the top-lit stairwell linking the building's four levels. 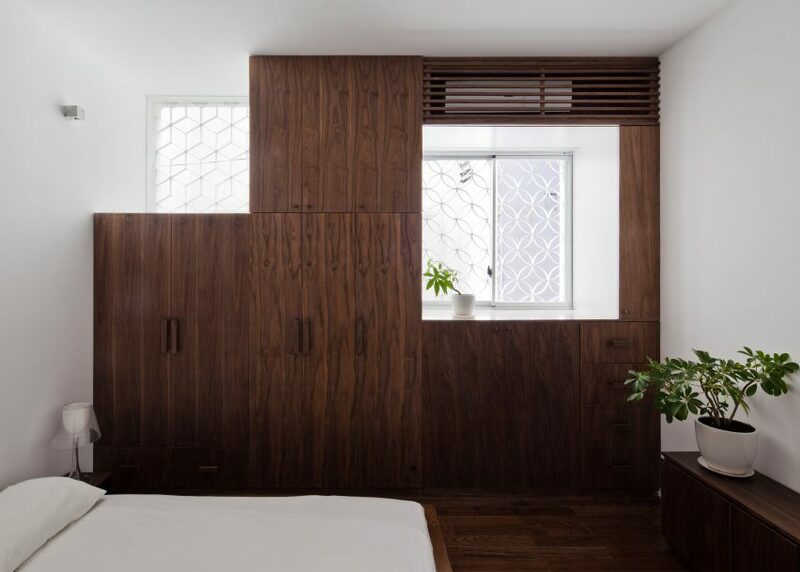 At the top of the building, a study with rich-toned wooden floors adjoins the planted terrace, and a wood-lined master suite, bathroom and walk-in wardrobe are located on the floor below. 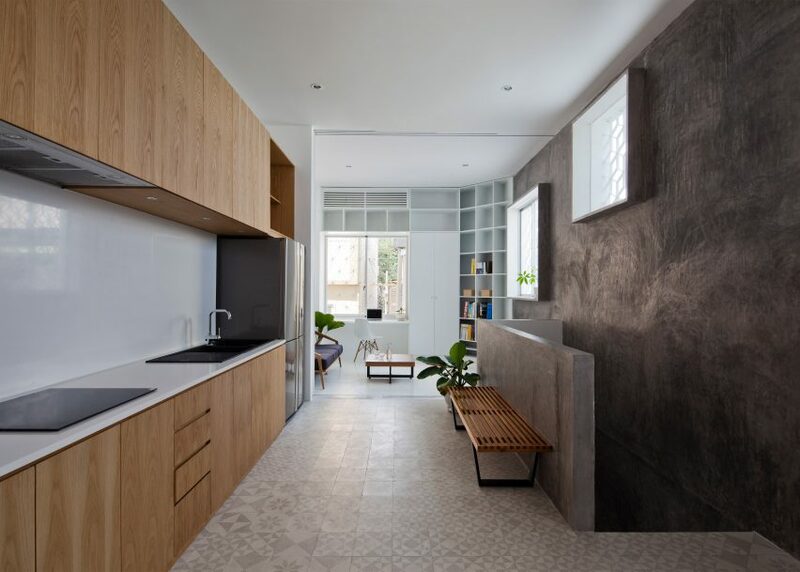 An open-plan kitchen and lounge finished in a combination of light-coloured wood and patterned tiles occupies the first floor, and a bedroom for the client's mother is set at ground level. Photography is by Hiroyuki Oki of Decon Photo Studio.